.....or another reason to teach your children to knit or sew or both - especially your male children. There is still a lot of stereotyping around and where it is easier for girls to ask to be taught to knit or sew, boys often avoid the opportunity because it might "label" them. Having the ability to sew was, obviously a big help to the two high school students who launched a Lego man into almost outer space this week. An article in this morning's paper details how they sewed together a parachute which they then attached to a Helium weather balloon, to aid in the return of a styrofoam "capsule" housing camers, warming aparatus and Lego man. Here is another article about the feat. http://www.digitaljournal.com/article/318584. They are now famous!!! But for want of a stitch the project might have been lost!!! One of the things I really loved about the story is that when the capsule came back to earth, it landed about 170 kms away in Peterborough. One of the boys' dads drove them out to find it but it was too cold and dark so they had no lluck. Well I would have stayed over and gone out in the morning - but no - they drove home and went to school for a week and then headed out on the following weekend to find it. What amazing self control and dedicated work ethic﻿. With these smarts and focus they will go far. Well done cutty sark!!! 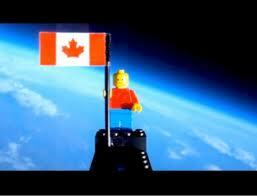 Oh yes, and Lego has gotten a lot of free advertising, not to mention Canada. Have an out of this world day!! !